Kendrick Lamar joins Justin Credible and J Cruz on the Liftoff, to speak on his new track "i" and how his lyrics impact his fans. 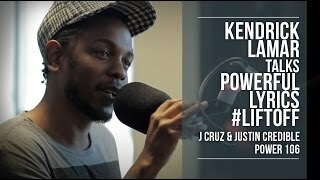 Kendrick Lamar Talks Powerful Lyrics Kendrick Lamar joins Justin Credible and J Cruz on the Liftoff, to speak on his new track "i" and how his lyrics impact his fans. About Kendrick Lamar. Kendrick Lamar Duckworth (born June 17, 1987), better known as Kendrick Lamar, is an American rapper and songwriter from Compton, California. Kendrick Lamar Lyrics. Overview / Lyrics (see all) / Photos / Videos / News. it's good to share. print correct. good kid Lyrics from good kid, mAAd city.